The term "merchandise mix" is essentially the product assortment that a retail store offers. It refers to the breadth and depth of the products a given retail store carries on a regular basis. It's not always easy to find a good balance among the products a store could choose to offer, so it's worth considering carefully. 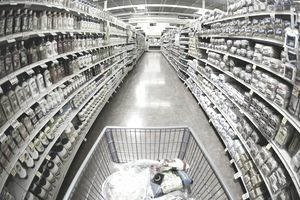 If a store stocks too much of a variety of merchandise, it may lack focus, which could confuse customers. If they're not clear on what the store offers and what they can buy there, it's going to be hard to get customers to return. On the other hand, if a merchandise mix is too small or limited, the store runs the risk of being overshadowed by better-stocked competitors. Take department stores as an example. A large department store like Macy's stocks clothing, home goods, beauty products and some luxury items. That seems like a large mix, but it's in keeping with Macy's established brand. If a new store tried to take on all these categories of merchandise, it would likely be overwhelmed and unable to compete on the same scale as Macy's. So how can a retailer figure out what items to sell and which might be better off out of the mix? There are a few key indicators to consider. To answer this, look at a few key business metrics, such as your inventory status, price-point analysis, square-inch analysis, category analysis and gross margin percentage. Each metric provides insight into the answer, as well as having customer information provided by marketing (data such as items per order, response rates, response to offers, etc.). It's important not only to know what your customers have bought in the past but to understand what they might buy in the future. Since most retailers don't have a crystal ball, how can they possibly predict what customers will want? Try asking the customer. Get to know what items your customers are willing to pay for, and where they see any value. That will help you figure out what changes you should make to your merchandising mix, and what things you should leave alone. As the old saying goes, "if it ain't broke, don't fix it." Let's say you've got two vendors. One has dynamite products that people are willing to pay top dollar for, and you can't keep it on the shelves. But this vendor is difficult to work with, and has cost you time and money trying to get him to deliver on time and as promised. The other vendor has a product that doesn't break records but is a steady, reliable seller. He delivers when he says he will, and doesn't give you any unwelcome surprises. Clearly, in the above scenario, it's tempting to risk using the first vendor because of the huge potential for reward. But if you consider the time and energy you have to spend on this vendor, are you getting the return on your investment that you need? Probably not. Your merchandise mix should reflect who you are as a company, and that includes your customers and vendors. Consider these factor carefully before you stock your shelves.